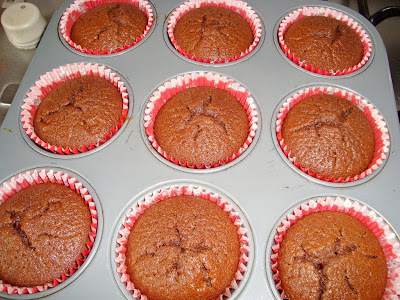 I’m surprised the Coca Cola Cupcakes won; frankly I thought the idea of putting Coca Cola into cupcake batter would put most of you off, but I’m happy they won because these are, as I previously said, one of my favourite chocolate cakes! The Coca Cola goes into the cake and icing mixture, but they don’t have an empowering Cola taste. In fact, were it not for the icing, you’d probably never notice that Cola is one of the main ingredients. I must say the cake tastes even more fantastic when it’s a cake, not cupcakes, but these look so adorable! Rating 4.5 out of 5. - Preheat the oven to 350°F and put in a baking sheet at the same time. - In a large bowl, combine the flour, sugar, baking soda and salt. Beat the egg, buttermilk and vanilla in a measuring cup. In a heavy-bottomed saucepan, melt the butter, cocoa and Coca-Cola, heating gently. Pour into dry ingredients, stir well with a wooden spoon, and then add the liquid ingredients, beating until everything is well blended. 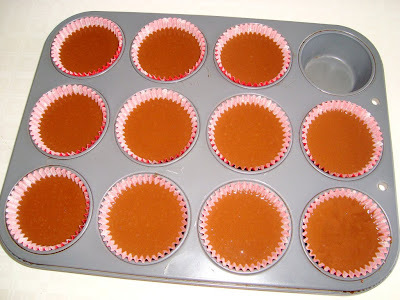 - Pour into a 12-cup muffin pan lined with paper baking cups. And bake on the warm sheet for 20 to 25 minutes. The top of the cupcakes will be cracked. Leave to stand 15 minutes in the pan before unmolding. 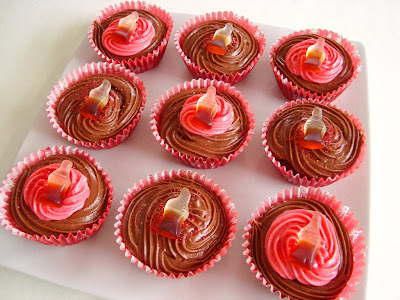 - You could buy those wine-gummy candies which look like miniature bottles of Coke and press one in top of each cupcake once the icing’s cooled a little before it has set hard. 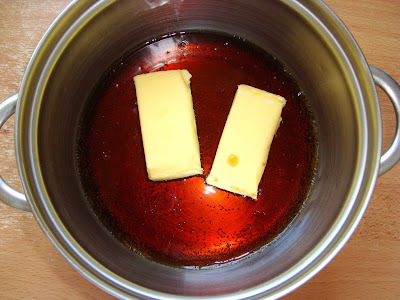 The Coca-Cola and butter. You don’t even need to get your mixer out; everything in this recipe is stirred with a wooden spoon. I’d probably would have gotten 12 cupcakes out of this batter if I hadn’t eaten so much from the bowl. The lickable batter is guaranteed to fix up your chocolate-crave! Cracked and baked! This chocolate cake has a peculiar consistency; the top tastes dry and somewhat hard, while deep down the cake is heavy and moist! Simply splendid! Iced and decorated. I used red Christmas cupcake liners to intensify the Coca-Cola theme. i am totally intrigued by these. Recently someone told me about a Coca-Cola cake...never heard of such a thing. These sound fantastic and fun. Haha I love that you ate the batter. Good to know these cupcakes are tasty at every stage! I voted for these cause I love somethin' different and I'm glad I did cause they look and sound great! These are so much fun and beautifully decorated! You have talked this recipe up! I am thinking I need to test it for myself...next time I need chocolate cupcakes! Love the little cola bottles on top - cute! These sound great, and look adorable! Have a sweet day! I have a similar recipe for coca-cola cake, but I am afraid of how it is to put this drink in a cake. But now I see that it's worth to try! I've had coca-cola before and I actually liked it which was surprising as I generally don't like anything chocolate. Love the little coke bottle candies on top! thank you thank you for converting this into an Imperial measurement recipe. I have the How to be a Domestic Goddess book, but well, let's just say I'm not domestic goddess enough to try and figure out metric to imperial.